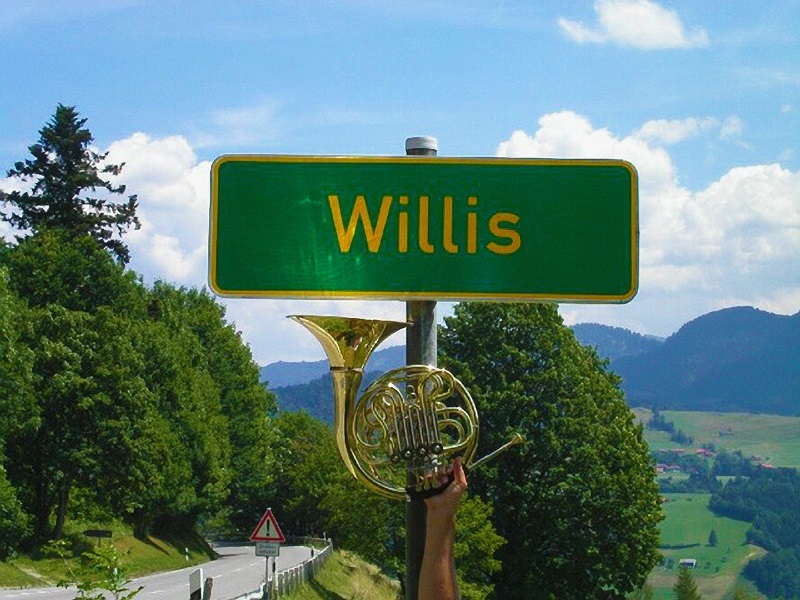 Sarah Willis's day job is as a member of the horn section of the Berlin Philharmonic. In recent years she has also become a roving ambassador for the instrument and a familiar face presenting and interviewing on the Berlin Phil's Digital Concert Hall. In 2010 she released her first solo recording, of the Brahms trio for horn, violin and piano. That combination of instruments is once more the foundation for her second solo CD. But there all similarities end. Horn Discoveries migrates from blues to classical contemporary, stopping off in light romantic territory on the way. There is also a sprightly set of horn duets composed by and performed with Willis's Berlin colleague Klaus Wallendorf. The horn chamber literature is thus expanded in several different directions, but the main direction is downwards, as Sarah Willis explains to theartsdesk. JASPER REES: Your first CD was the Brahms Trio. Despite the fact that you're still in a trio with a violin and piano, this is a hell of a leap away from that. Why the decision to commission a lot of new music for the horn? SARAH WILLIS: It wasn't a conscious decision – it just developed. 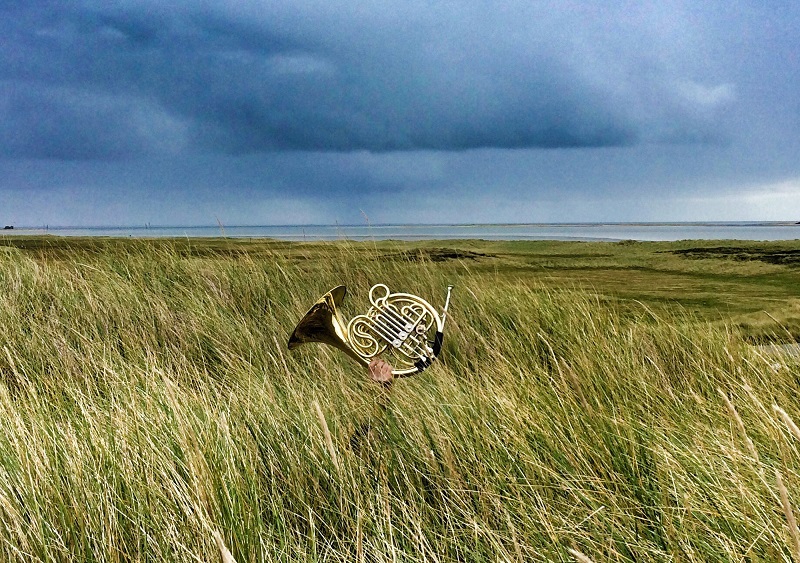 My job in the Berlin Philharmonic is "low horn" and we are the supporters, not the soloists, so making another CD wasn't really on my to-do list… But people kept asking when the next CD was coming out so I thought, why not? Deciding what repertoire to record wasn't easy: there are very few pieces out there specialising in the range I like to play in; all the horn highlights have already been recorded many times by amazing horn players and also I like to be a bit unpredictable and different. So there was only one thing for it: find new pieces! I would love to be able to say that there is some deep philosophical meaning why I chose all these pieces to record together, but the truth is that I wanted new pieces and was lucky that I love all of these. I was sure the horn world would be happy to include them in their repertoire. The bluesy Song of a New World by Richard Bissill [principal horn of the Orchestra of the Royal Opera House] is a real technical challenge but so much fun to play. It is such an honour to have a piece written especially for me, and what a piece it is! David Riniker´s Romantic Trio arrangements are good for the soul and suit the horn sound perfectly and they are all pieces everyone knows and loves. Klaus Wallendorf´s Willisabethan Sarahnade is a real piece of my life history – and Klaus is my favourite duet partner of all time (Klaus Wallendorf pictured above with Sarah Willis) – and the Mason Bates Mainframe Tropics is a very cool piece which challenges both musically and technically. I actually felt that I had the easiest time of the three of us in the Bates piece – Kotowa and Philip (Kotowa Machida and Philip Mayers pictured below with Sarah Willis) have incredibly difficult parts, and played them amazingly well. The horn sound that most regular listeners will know is the daredevil high-pitched stuff. 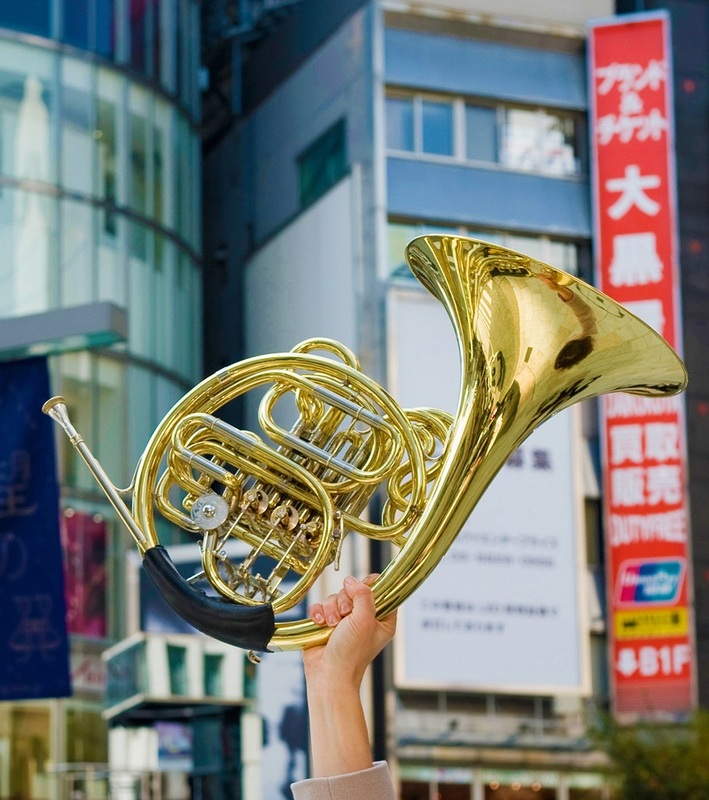 What are the particular qualities of the low horn that you are keen to share? There's no set way to have your picture taken with a horn. You've gone down a new path by having the horn appear out of the water like Excalibur. How did you get that shot for the CD cover? I was in Singapore with Stefan Dohr [the principal horn of the Berlin Philharmonic] and on the roof of the hotel we were staying in there was this amazing infinity pool. The minute I saw the pool I thought, "Horn photo!" We got some very funny looks from the hotel guests as the two of us appeared in swimming costumes carrying our horns. It started to rain but that didn't put us off. 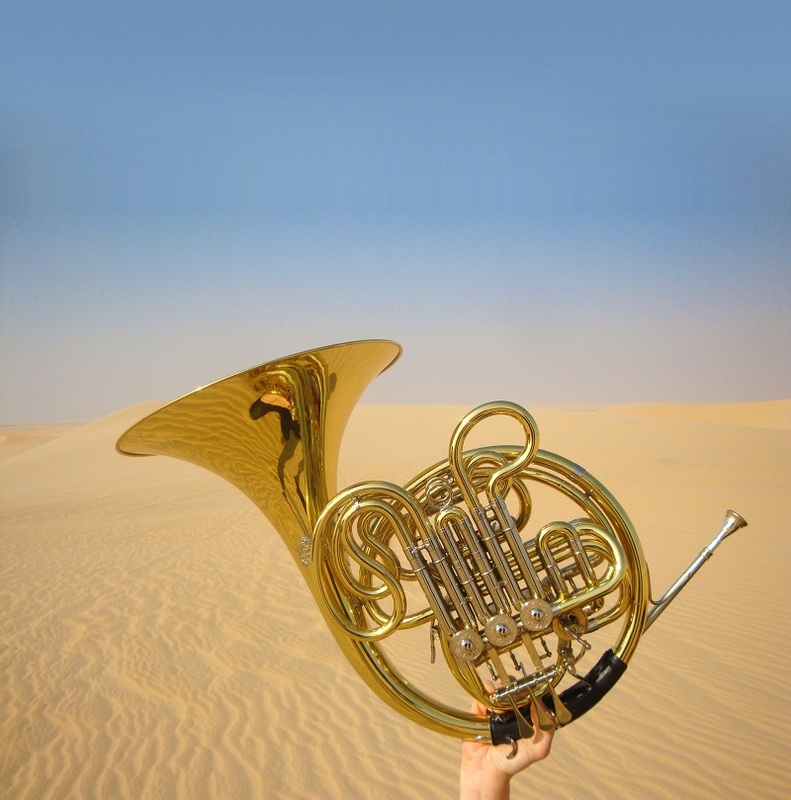 We have some fantastic photos (there are some making-of photos in the CD Booklet) but this one on the cover of Horn Discoveries was so good that so I saved it for a special occasion. It was a choice between a smiley portrait of me for the cover or this photo, and I think we made the right one. 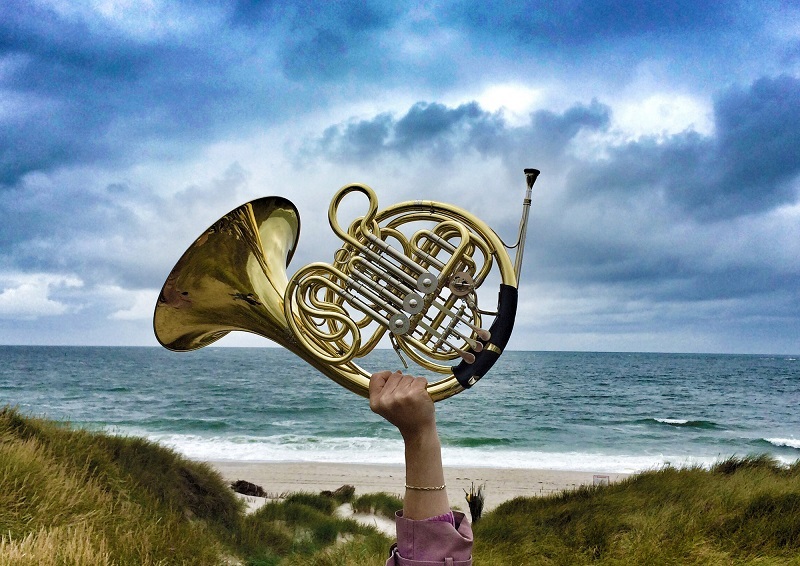 For anyone in the horn world you are known to be a very active figure via social media and your Horn Hangout interviews with celebrated soloists and orchestral musicians. Is there something about the instrument that uniquely encourages such a devoted following? Horn players are a very sociable bunch. It is hard to explain but through my online activities I have discovered that horn players all around the world are really proud to play our wonderful instrument and through the Horn Hangouts we have built a global horn community which is so much fun to be a part of. This feeling of being connected is important to many of us horn players. Maybe it is because our instrument is such a dangerous one to play so we like to stick together. We are like stuntmen, after all, as Sir Simon Rattle points out at the end of this video. You have also been a visible presence on the Berlin Philharmonic’s Digital Concert Hall. Is that a form of orchestral promotion that can only grow and grow? Nothing can replace the experience of being at a live concert. But there are many people around the world who love the Berlin Phil, know them from recordings, but do not have the opportunity of being at a live concert. For these people the Digital Concert Hall is a dream come true and I´m very proud that my orchestra has this wonderful digital opportunity. It´s a wonderful feeling to play a concert in Berlin and know that my Mum is watching live in London. And yes, this medium is already expanding, a lot of other orchestras and artists are live streaming their concerts and events. I watched my friends in the Sydney Symphony Orchestra play a live concert from the Sydney Opera House the other day. I think it´s great. Your record label Gebr. Alexander of Mainz also make the horn that all the Berlin section use. What is it about the Alex that you play on? How does it differ from, say, a British Paxman or a Japanese Yamaha? I have been playing an Alexander horn since I was 16 years old and it is the horn that best suits the way I play and helps me create as beautiful a sound as I can. 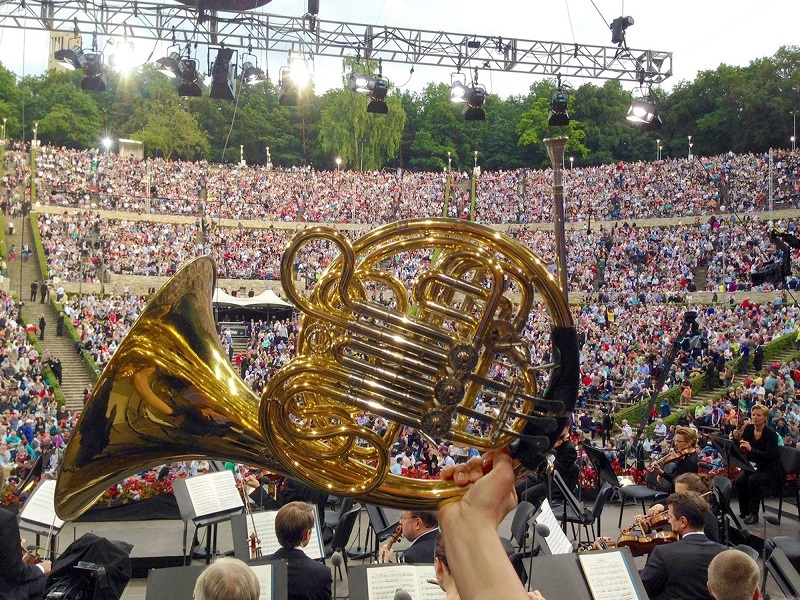 In the Berlin Phil horn section we all play on Alexander horns, which makes working together and blending as a section a lot easier as we all play the same type of instrument. It is about personal taste and although Paxman and Yamaha also make great horns, I prefer playing on an Alexander. You've travelled all over the world as a horn player and had fun taking pictures of the horn in all sorts of contexts – with animals and in the great outdoors (see gallery overleaf). They neatly remind us that the horn started life in the great outdoors. How obsessive did you need to be to secure those images? A very good friend of mine is the vet at the Berlin Zoo and he is also a very good amateur horn player. I trade horn lessons for being able to meet the animals up close. It's a great deal. My favourite encounter was playing for the elephants during an interview for German TV. While giving the interview I was inside the elephant enclosure feeding them apples out of my horn bell. But when I wanted to play for them, the keepers said I could only do it from outside the enclosure, as they had a baby elephant in the herd and they weren't sure if the others would consider my horn noises a dangerous threat. You can see what happened (in German). 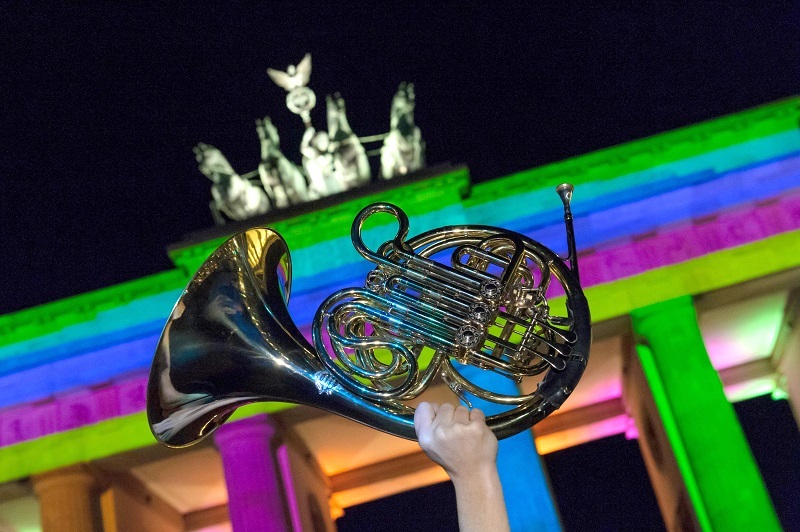 Are the Berlin Phil horns going to record another CD? You can't say who, but do you have your money on a candidate to replace Sir Simon in Berlin? Nice try, theartsdesk. My lips are sealed. 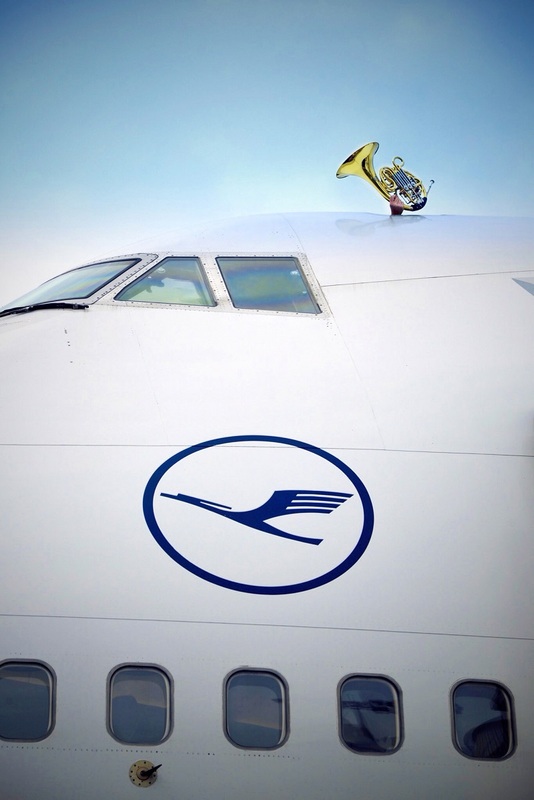 So wonderful to hear the low horn celebrated! Love the CD and I highly recommend it! Thanks, Sarah.